Near record high temperatures Wednesday will quickly give way to frigid air moving in overnight, leading to the season’s second snowstorm Thursday. A winter storm warning has been issued by the National Weather Service for Ocean County from 4 a.m. to 4 p.m. Thursday. 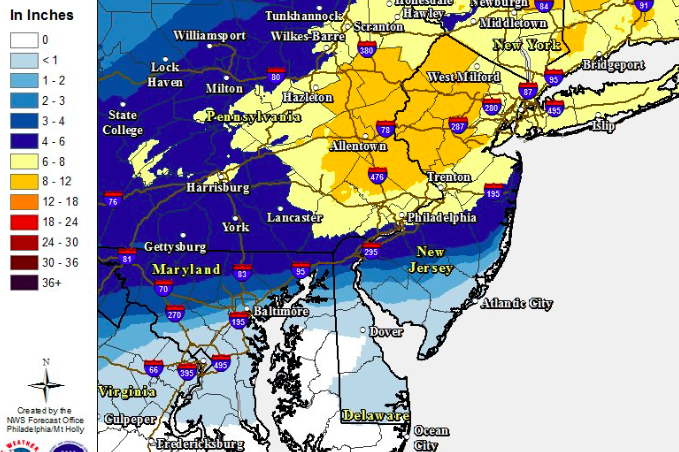 Forecasters are calling for 4-6 inches of snow, with locally higher amounts possible, especially in the northern portion of Ocean County. The storm will come after a forecast high of 62 degrees on Wednesday. The storm will begin as rain, which will overspread the area between midnight and 3 a.m. Thursday and change to sleet and then snow from northwest to southeast by dawn Thursday. The snow will be heavy at times Thursday morning before quickly tapering off from west to east during midday or the afternoon. According to the warning, the heavy snow will make many roads briefly impassable and may produce widespread power outages due to the weight of the snow on tree limbs and power lines. Temperatures will begin falling into the upper 20s to around 30 during the snow then a slight afternoon warmup Thursday, the forecast said. The storm will also bring wind gusts of up to 35 mp.h.